Registration for this workshop is now closed. For information on future workshops, sign up for our e-list. Fee: $85/$75 members (all materials included). If you prefer to pay by phone, give us a call at 414-446-8794. Working in clay is deeply satisfying, and making pottery allows one to explore aesthetics and function simultaneously. In this workshop we will make two vases from start to finish, using porcelain as our clay material. We will use the handbuilding technique of slabs, piecing them together to form our vases. We may even add a handle to transform a vase into a mug or small pitcher! To finish, we will embellish our work with surface decoration using texturing techniques and brushwork. 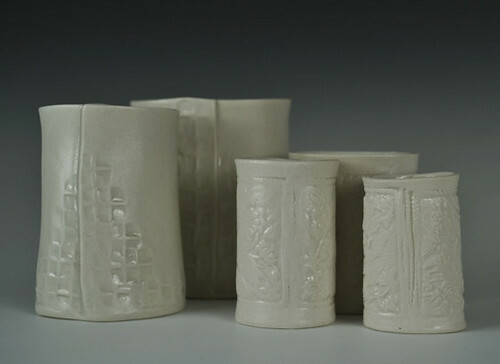 The vessels will then be fired with a clear glaze to protect the surface and make them functional. Bring a bag lunch and beverages and dress for studio work as well as the outdoors. We’ll be making use of Lynden’s 40 beautiful acres during our breaks, weather permitting. You will need to return at a later date to pick up your pieces. Linda Wervey Vitamvas earned her B.S. in Nursing from the University of Wisconsin-Milwaukee and practiced psychiatric, obstetrical and surgical nursing before returning to UWM for her M.F.A. Vitamvas has won awards in the 2009 Wisconsin Biennial, Forward: A Survey of Wisconsin Art Now, and the 2005 and 2010 Kohler Eight Counties exhibitions. Her work has been featured in the 2010 Wisconsin Triennial at the Madison Museum of Contemporary Art and in solo exhibitions at the Museum of Wisconsin Art in West Bend and at the Wisconsin Academy’s James Watrous Gallery in Madison. She has also exhibited at the Milwaukee Art Museum and the Villa Terrace Decorative Art Museum as well as in ceramic arts exhibitions nationally. Linda Wervey Vitamvas is currently an artist-in-residence at the Lynden Sculpture Garden; you may read more about her residency here. Handbuilding I: Bowls from Lynden Sculpture Garden on Vimeo.